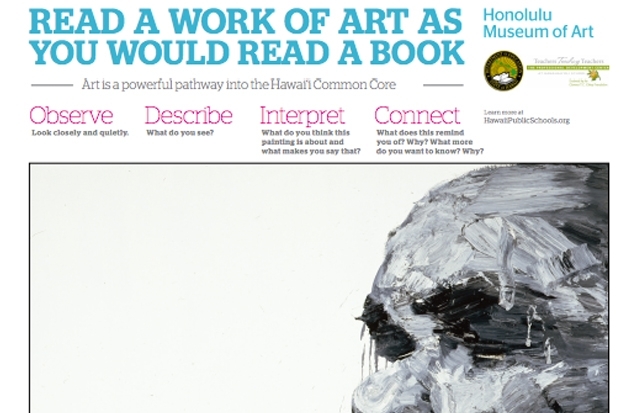 Over the past year, educators from the Honolulu Museum of Art have worked closely with educators from the Department of Education and Hanahau‘oli School to create a series of visual art education posters that have been distributed to every DOE school classroom on O‘ahu. These posters are also available to any other Hawai‘i-based teacher by request. We are excited to announce that we have now completed five posters that all feature Hawai‘i-related art: Juliette May Fraser’s Lei Sellers; Hubert Vos’ Study of Hawaiian Fish and Kolomona: Hawaiian Troubadour; Theodore Wores’ The Lei Maker and, hot off the press, Yan Pei-Ming’s Portrait of Iz. Learn more about the project, download a pdf of each poster and find additional resources on our website under Teacher Resources. These posters can be used as a tool to help students hone their visual thinking skills, which can translate to literacy skills and also be applied to any subject that requires thorough observation and an ability to describe what you see. Background information about the artist, historical contexts, as well as additional resources can be found on the back of the poster. Haven’t received your posters? Email Jenny Engle at gro.muesumululonohnull@elgnej. Please specify which poster you would like (including a complete set), and include your name and mailing address.